There was a herd of very ferocious elephants. Because of their sheer strength, they used to torment other animals. There was a pond in the jungle, which was always occupied by the elephants. Due to that, other animals were unable to drink water. There was a bunch of rabbits living in a neraby bush. They asked their leader to talk to the elephants to find some way out. When the leader of the rabbits went to the elephant king, he just laughed off at him and said, “Might is right”. The leader of the rabbits was highly annoyed at the rude behavior of elephant. He thought of another plan to make the elephants fall in line. He once again went to the elephant king. It was a full moon night. The rabbit said that he was the messenger of the moon. He said that the moon was the god of the pond and he was not happy with the elephants. The elephant king became angry at hearing that and said he did not believe what the rabbit said. 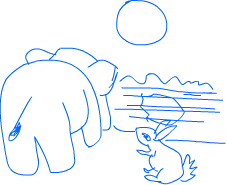 Then the rabbit said, “You can come with me near the pond where I will arrange a meeting between you and the moon." Elephant agreed to go to the pond to verify what the rabbit said. When they went near the pond, rabbit indicated towards the reflection of the moon in pond water. Elephant thought that the god of the pond had descended down to the earth to show his wrath. Elephant was frightened deep in his heart. He promised to the rabbit that his herd would no longer distrub any other animal. After that, peace returned to the jungle.